I should first confess that I love chicken thighs. While chicken breasts are often dry and flavourless, chicken thighs are juicy and taste like, well, chicken. This Fine Cooking chicken thigh recipe has become a favourite for its simplicity, versatility and ability to impress. 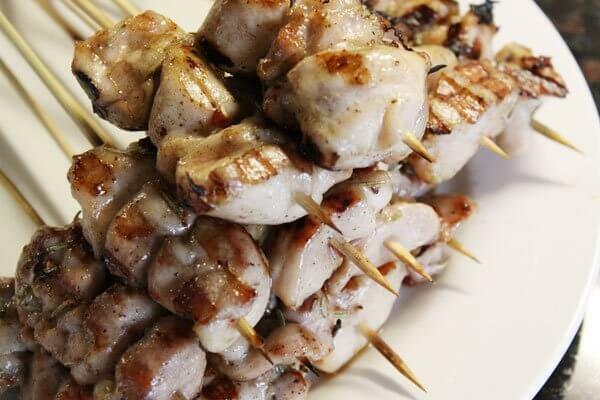 If you’re going to be serving this to guests, serve the chicken on skewers. If it’s a weeknight meal, skip that step and just grill the thighs whole. The prep only takes minutes. (I’ve altered the instructions a bit such that you simply mix the sugar and spices with the oil, then toss with the chicken.) Despite a seemingly simple combination of spices, the mixture packs a punch. If you don’t have fresh rosemary on hand, you can get away with dried rosemary.